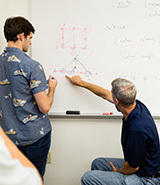 As a mathematics major or minor, you will become familiar with a wide variety of mathematical topics, as you develop and strengthen your critical-thinking, problem-solving, and communication skills. These skills include deductive and inductive reasoning, problem recognition and modeling, and the ability to clearly articulate problem solutions to others, both verbally and in writing. Such skills are essential for responsible leadership, effective global citizenship, productive careers, and meaningful lives. Mathematics is more than equations and formulas. Our curriculum stimulates curiosity that goes beyond just working with formulas and numbers but concentrates on the “why” question. As you advance in the major, you acquire skills such as making critical observations, understanding concrete and abstract problems, seeing the big picture, paying attention to details, extracting patterns, prioritizing information, and executing data. Critical thinking and problem-solving skills are the key components for success in today’s world. As the world becomes chaotic and complex, you will be equipped with the skills to tackle big problems. 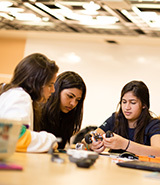 You will engage in interdisciplinary thinking and explore the connections of mathematical subjects to many other disciplines. We provide a friendly and collaborative environment for you to improve your knowledge not only in core-curriculum mathematics courses but also in interdisciplinary areas such as Financial Mathematics, Mathematical Modeling, and Operations Research. This allows you to relate mathematics to your life experiences, thereby increasing your potential impact on society. At Rollins College, you will have opportunities to do mathematical research inspired by the needs of communities around the world. In the past, student research project topics varied from developing a mathematical model for breast cancer, to providing financial advice to Nepalese investors on optimizing their portfolio. There are many interesting and exciting things you can do with a mathematics degree besides teaching. Many of our students are recruited for internships and undergraduate research projects early in their college careers. Once they graduate, they accept positions in financial industry, government, education, and graduate schools. The Rollins Computer Science program will educate you to be an effective problem solvers, responsible technical leader, and global citizen. Computer science and its related fields are driving change in every aspect of human society, including communication, media, business, and government. 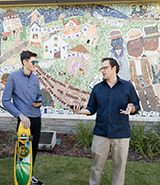 The Rollins Computer Science program will educate you for a future in which technology skills are a requirement for both career success and informed citizenship. 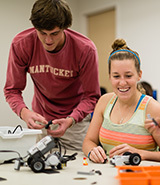 The Computer Science program supports your learning through a variety of activities that allow you to apply your skills in real-world contexts. Recent students have done community engagement work with elementary school students, developed apps for a local historical society, and interned with some of the world’s top tech companies and labs, including Amazon and NASA. The program supports your learning through high-impact practices, such as internships, research experiences, community engagement, and international experiences that develop a global perspective. Responsible leadership in the 21st Century requires the ability to understand and evaluate technology. Computer science majors develop critical thinking, written and oral communication skills, and sensitivity to the ethical issues raised by technology in our society, including privacy, data security, and AI. Computer science degree holders are in high demand. 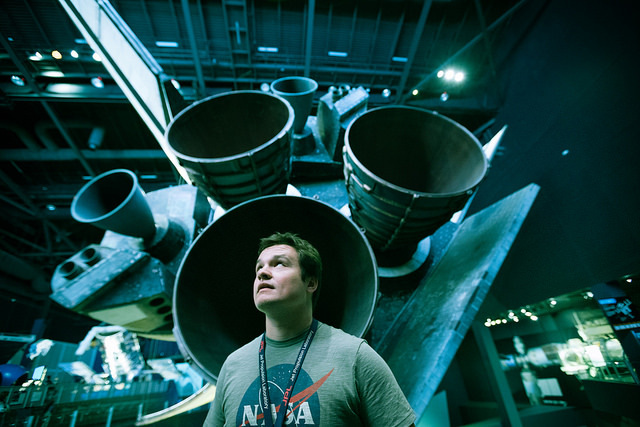 Our alumni work at some of the world’s leading software and tech companies, including Apple, GitHub, and Los Alamos National Laboratories. Others recent graduates have gone on to prestigious graduate programs at Georgia Tech, UC-Berkeley, and the University of Notre Dame, among others. You will develop proficiency in all core areas of computer science, including programming in multiple languages, systems, and the fundamental math of computation. You will be adept at best practices of modern software development, including agile methods and test-driven development. All computer science students complete multiple large-scale team projects during their degrees. The CS program also offers a minor that can complement any other major. Change, adaptation, and life-long learning are essential for computing professionals. More than just programming, a computer science degree will equip you with the problem solving and communication skills that will serve you for the rest of your life, regardless of the path you take.